A touch-screen control platform for easy automation of laboratory and light industrial motion control systems has been introduced by Aerotech, a leading global supplier of positioning and motion control products. The new Ensemble LAB controls up to four axes of brush, stepper or brushless AC motors. The Ensemble LAB is designed for university research and manufacturing applications where ease of use is desired, the company says. The full-color touch-screen display enables quick access to all the core functionality while providing deep contrast and high readability. The intuitive tabbed interface provides single press access to all setup and operation screens. Besides, a front-panel USB port allows connection of a keyboard and other peripherals to assist in creating complex program sequences. In addition, the new system includes full compatibility with both EPICS and TANGO distributed control protocols, allowing it to seamlessly integrate into applications at all major research institutions. 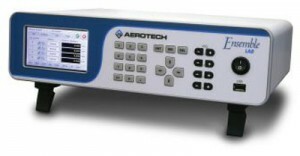 Aerotech’s MPS series stages support the Ensemble LAB’s FlashConfig feature. The stage is automatically identified and all operational parameters including axis calibration data are uploaded into the system. This ensures safe, accurate “plug-and-play” operation. FlashConfig provides maximum flexibility for laboratory environments where systems are often reconfigured to meet changing application requirements, the company adds. Ensemble LAB can run up to 4 programs simultaneously for easy partitioning of complex operations. The platform controls a variety of applications including point-to-point motion, linear and circular interpolation, single- and multi-axis error correction, direct commutation of linear and rotary brushless servomotors, and servo autotuning. As said, applications include: academic research, semiconductor manufacturing, electronics manufacturing (LEDs), test & Inspection, laser processing, metals inspection, micro-machining, nanotechnology and medical devices.